There’s a high chance you will find a bar of the Mysore sandalwood soap in every home in Karnataka. The soap is as popular today as it was a century ago. While you may not see too many advertisements for the soap, vintage prints are considered collectibles. Read on to find out more. While some soaps need to be advertised by film stars, the Mysore Sandalwood soap retains its position of being the most popular soap in Karnataka year after year despite having a negligible advertising budget. There are many people who would not mind accepting that they are addicted to the subtle fragrance of these soaps. Unlike other soaps from that era, Mysore soaps were designed in an oval shape to stand out. The erstwhile state of Mysore was once the largest producer of sandalwood in the world. When the World War I broke out, export of this wood to Europe was halted. It was around then that the Maharaja of Mysore at the time, Krishna Raja Wodiyar IV and the Diwan of Mysore, Mokshagundam Visvesvaraya set up a Government Sandalwood Oil factory at Mysore. The factory was established to extract oil from sandalwood and utilize the logs of wood that were waiting to be exported. A few years later, the Maharaja was gifted a set of soaps with sandalwood oil. This gave rise to the idea of making similar soaps in the Government Sandalwood Oil factory. Technical experts from Bombay were invited to work on the project at the Indian Institute of Science (IISc). A young industrial chemist, Sosale Garalapuri Shastry was even sent to England to study the soap manufacturing process. When he returned, he standardized the process of using sandalwood oil in soap. This led to the establishment of the government soap factory in Bengaluru. At the same time, a second oil extraction unit was set up in Mysore to ensure a steady supply of oil to the soap factory. A third such unit was set up in Shivamoga in 1944. At the time, soaps were created as cuboidal bars and packed in vibrant, glossy sheets of thin paper. 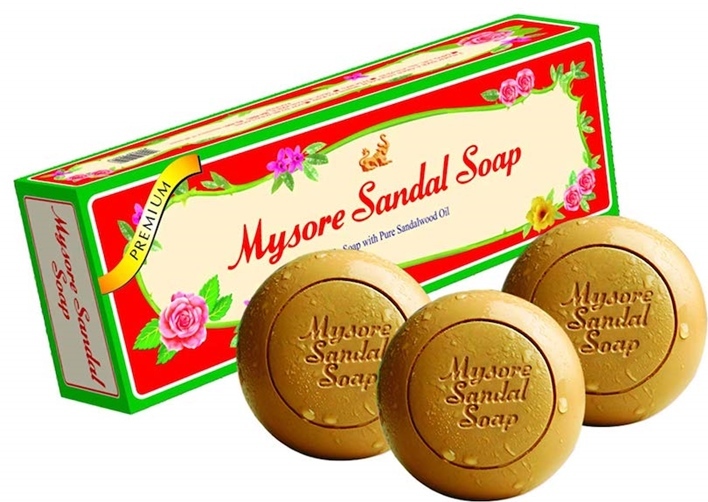 Sosale Garalapuri Shastry wanted the Mysore Sandalwood soap to stand out. Hence, he chose to give the soap an oval shape. This was then packed in delicate white paper and placed in a rectangular box that resembled a jewelry case. The colors and prints on the box were very carefully chosen keeping in mind the special place jewelry has in Indian culture. The Sharaba, mythical creature with the head of an elephant and the body of a lion stood in the center of the box. This creature not only symbolized the state’s rich heritage but was also considered a symbol of wisdom and courage. In addition, the words ‘Srigandhada Tavarininda’ meaning ‘from the maternal home of sandalwood’ were printed on each box. Mysore Sandals had a very unconventional advertising campaign. Neon colored signboards advertising the soap could soon be seen in many cities across India. In Karachi, the soap was advertised as part of a camel procession! The soap became so popular that soon it was in demand not only by the royals and masses in India but by people abroad as well. Many of the designers were artists in the royal palace. Each design had to be approved by the royal family before it could be published. Thus, each design was iconic in its own way. Today, there are many people who collect old advertisements of the soap just for their beautiful visuals.